Many a woman working from home soon finds her professional life elbowing in on her dining room. Rare, though, is the entrepreneur that converts her dining room into a retail space, sets regular business hours, and opens up her home to the public. 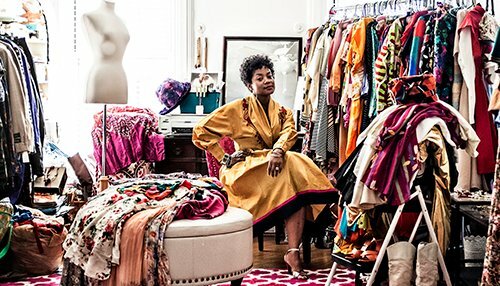 Meet Helen Nurse, founder and proprietress of New York’s TracyChambers Vintage: determined, creative, and—yes—rare. In early 2012, Nurse spied a market gap in affordable vintage clothing and so set out to rent a storefront, only to learn that rents in her Brooklyn neighborhood were sky-high. Beyond-reach sky-high. Most aspiring entrepreneurs would have shelved their idea as unfeasible and moved on. But not Helen. She redoubled her efforts, revisited her options, and arrived at an elegant, if unconventional, solution. In March of that year, she opened a vintage clothing boutique very close to home. In her home, actually.